We have always found Impact Moling to be very professional company who complete their work to a high standard and within our project time frames. Universal Technology have employed Impact Moling on many occasions over the last 8 years for both large and small projects and have always found them to be responsive, friendly and most importantly they work to budget. I would recommend them to anyone needing a duct installing with the minimum of â€œImpactâ€� to the landscape. Impact Moling work and operate in an extremely and efficient manner. 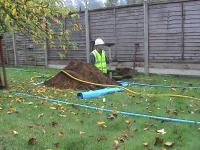 The reaction time from quote to carrying out the work was very prompt and the quality of work was top rate. The attention to detail and cleanliness was admirable and the way in which Sean operated was a credit to Impact Moling. We at the College have many listed buildings and the sensitivity and approach by Impact Moling guarantees that Winchester College will use them on our next applicable project. My wife and I employed Impact Moling earlier this year to mole a new water pipe approximately 500 metres across our land. Sean and his team arrived on time and also finished on time, acting in a courteous and efficient way throughout the project. At the last minute, we also needed an electric cable moled to our new dining hut. Despite a busy schedule, Sean managed to fit this in at a very reasonable price. 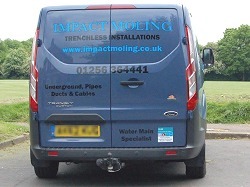 I am very pleased to recommend to you Impact Moling as a top class contractor in the Surrey and Hampshire area. Lisa, Please find attached confirmation that the payment has been made from my account to yours detailed on the invoice. Secondly I would like to say how pleased I am with the whole process of using Impact Moling, from friendly telephone contact, courteous site visit and thoughtful installation; in fact were it not for the fresh sand in the block driveway there is no evidence of the works being carried out at all. It is not often I have work done where there is nothing to say except thank you, so thank you. I will have no hesitation in recommending you to others needing such work. Regards. Done a very good job, very friendly and helpful. Would recommend them to my friends if they needed there pipes renewed. All working as discussed, carried out a great job, very pleased, will definitely be recommending them. Very neat & tidy workers. Couldnâ€™t tell anything had been done, which is how it should be. Very patient with the children who were fascinated by what was happening. It looks like they have never been here. Excellent manners, work ethic and cleanliness. Work completed quickly, VERY tidily, turf reinstated etc. Helpful, willing to adjust things at last minute to accommodate changes to the plan. Will definitely be using IMPACT again. We have used Impact Moling on several key projects for our business premises in Staines and Chertsey and always found the service provided by Sean and Pat was both friendly and professional. We are very happy to recommend them. Nigel Warrilow, Finance Director, Focus 21 Visual Communications Ltd.
As a service they are efficient and reliable, as people they are polite and conscientious. Of the numerous jobs they have undertaken for us we have always had complete customer satisfaction and the team at Impact Moling are consistently go the extra distance required to ensure customer satisfaction. Very reliable and efficient workmen. Impact Moling has done several jobs for me over the last few years and will remain a vital link to my organisation. Their work habits technically is excellent and always have completed on time and at the agreed price. Customer care is their upmost important and liaises with clients every step of the way. I have no problem in highly recommending them to any client and intend to use their services for a long time in the future.